Welcome back to Ready Artwork’s Web Wednesday, where we’ll be discussing the importance of Google Chrome and keeping your website up-to-date. 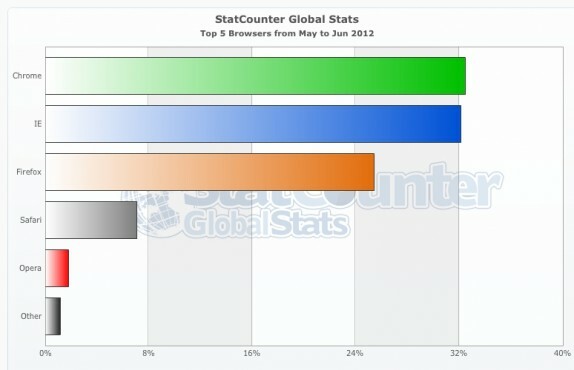 Over the past month and a half, the Google Chrome web browser became the number one Most Used Browser (globally) according to Global Stats. But what does Chrome’s new #1 status in the world mean for you and your business? Well, as web browser technology advances, users will inevitably have higher expectations for the websites they visit. If your business uses an outdated web 1.0 table layout, such as Internet Explorer 6, you’ll find it harder to hold your visitors’ attention, much less encourage them to return to your site again and again. Modern browsers that support HTML5 and CSS3 offer a growing number of creative tools to help make your website sophisticated and attractive. So, what’s good for your website is good for your business. Of course, Microsoft isn’t taking Google’s new lead without fighting back. Check out Microsoft’s latest ad campaign introducing Internet Explorer 9, which now supports some of the HTML5/CSS3 specifications. The Internet is constantly growing and if you want your business’ online presence to be fresh and engaging, you’ll need to keep it up-to-date and as user friendly as possible. That’s why, at Ready Artwork, we build websites for small businesses that provide the latest web design and technology. Talk to us at 626.400.4511 or write us for a Free Consultation on planning your new website!